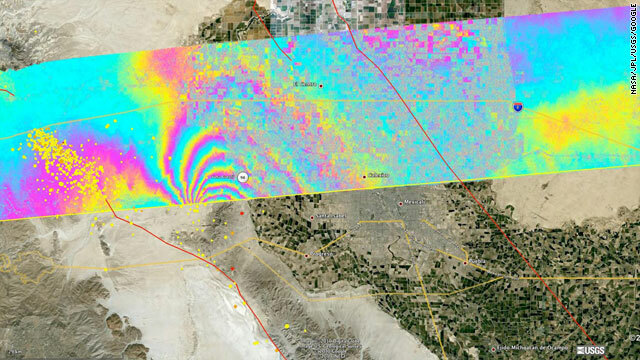 An interferogram of the April quake in Baja California is overlaid atop a Google Earth image of the region. (CNN) -- A team of scientists at NASA's Jet Propulsion Laboratory, in Pasadena, California, has developed a new imaging technology that could one day lead to the prediction of earthquakes. The new airborne radar-based mapping technology allows scientists to see earthquake images on the ground for the first time. "Hurricane imaging has 40 years on us. In the 60's they got the first satellite images of hurricanes. So now we're in 2010, and we have the first airborne image of an earthquake," said Andrea Donnellan, a geophysicist with the NASA lab. The new earthquake maps show the deadly movement of the ground during the 7.2 magnitude quake that struck Baja California in early April. The interferogram images, which are a photographic record of light interference patterns, shows colorful images of lines in undulating butterfly-patterned lines and dots in psychedelic colors. The maps were collected from a Gulfstream-III aircraft equipped with a radar antenna on it. The pilots had actually been making measurements over the area in southern California since the spring of 2009. "So what we've done is we (flew over) that same line after the April earthquake and looked at how the ground moved," Donnellan told CNN Radio. The interferogram "shows us how radar waves between two passes of the airplane interfere with each other. So when the ground moves you get these fringe patterns. They're kind of like tree rings in a tree. The more tree rings you have, the older the tree is. The more fringes you have, the more ground motion there was." The airborne images show tiny or large motions that occurred beneath the surface of the earth, on the fault line, which can't be seen by flying over an area or walking on the surface. Donnellan explains scientists can use the maps to determine how the fault lines are behaving. "We combine the surface image with the computer models to find out what the faults are doing at depth," Donnellan said. What about predicting an earthquake or creating a warning system like those used for tornadoes? "We're not doing short-term forecasting of earthquakes yet.....It's going to take years of observation and years of studying earthquakes to see what we can detect. But we're pretty confident that we can improve the current hazard maps, which have 30 year-type outlooks, to five to ten year outlooks. And if you have that, you can start to prioritize where you retrofit your buildings and bridges and dams, so that they're more earthquake safe," Donnellan said.